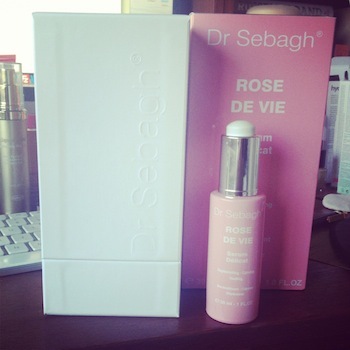 Dr Sebagh’s Rose de Vie serum comes with enough packaging to house a light aircraft. Seriously. A glossy white box the size of a double garage and then a pink cardboard outer box – all very pretty and swish, but not necessary. I repeat: not necessary. Worth the splurge? Well, as with all incredibly dear beauty products I do think that you have to weigh up your financial situation and go from there. In the same way that you wouldn’t splash out on £600 Jimmy Choo boots if you couldn’t make your mortgage repayment (at least I’d hope not!) you shouldn’t go without your lunch money for a moisturiser, no matter how amazing people say it is. There are always affordable options for beauty products – they may not be identical, they may differ slightly in quality (or not, as is so often the case) but you can usually find something that does the job for less. 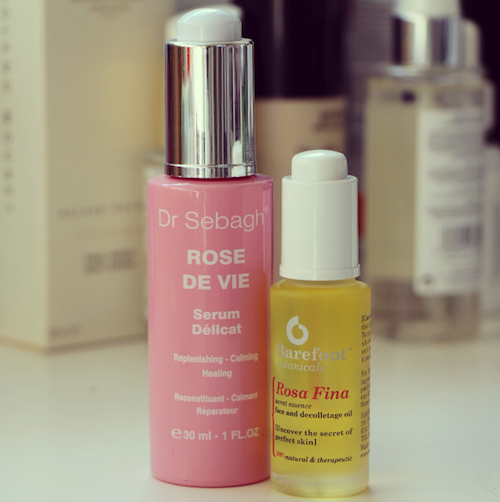 Saying that, I do think that the Rose de Vie is a gorgeous formula. There are plenty of rose serums and treatment oils out there, but this one feels refined and light and doesn’t leave a residue on the skin. It does feel as though it’s moisturising and protecting and all of the things it says on the box. It never feels too much for my skin, even though I can get oily in the T-Zone, and I never worry that it’ll break me out overnight. I do see this as more of an “emergency fix” than a daily staple, mainly because of the price. It’s a great one for holiday and post-holiday skin and to help heal faces that have been inadvertently over-exfoliated or Clarisonic-ed. Used as an occasional pamper treat, (and kept in a locked box away from husbands), the price of the Rose de Vie can just about be defended, I think. If, however, you wanted a slightly cheaper option – still very lovely – then you could do worse than to have a look at Rosa Fina from Barefoot Botanicals. This isn’t quite so light and it has a much stronger scent (though still not overpowering in the slightest) but it’s a good old blend of different oils including Rosehip for helping with scars or marks on the skin. If your skin is incredibly dry over the summer (or winter, for that matter) then a couple of drops of this pressed into the skin before moisturiser works a treat. You can also mix into your moisturiser to create your own customised blend, as with all oils. Full ingredients list and free delivery at FeelUnique.com – it’s £28. Previous Post NEW Advanced Night Repair: Sleep in a Bottle – and it takes the Rubbish Out! Next Post Daily Fix Subscribers: Some Admin!